For the longest time, I’ve been intimidated by scones. Not in the “omg I’m making a presentation in front of a board of directors filled with powerful men and women and omg are my armpits sweating?” kind of way, nor in the “gahh this guy beside me in yoga class is so hot and his chatarunga is perfect and he just smiled at me but I’m not sure because I’m blinded by my own sweat” kind of nervousness or even in the “I just met a famous person and she just shook my hand and oh gosh my hands are so sweaty” kind of intimidation. Scones are just intimidating because it’s so… British? Something that the queen might eat at a tea party? Too proper or too dainty? Proper and dainty and British aren’t words used to describe my baked goods either. But I’ve eaten enough scones by now to know that they aren’t necessarily that precious. In fact, I’ve had plenty of lumpy, misshapen, rustic looking scones. And if there’s one thing that makes me want to buy an entire Anthropologie store and bake some breakfast goods all day everyday, it’s the word rustic. So I tried my hand at making scones. For the first time ever. I always thought that scones would be hard to make, but in fact these were just the opposite. This is a one-bowl recipe. I didn’t use a mixer, or a biscuit cutter. And I read plenty of other recipes to know that if your dough is too wet, just add a tablespoon or more of flour. Or if your dough is too dry, just add a tablespoon or more of milk. In other words, it’s an easy, forgiving recipe. And what do you know? 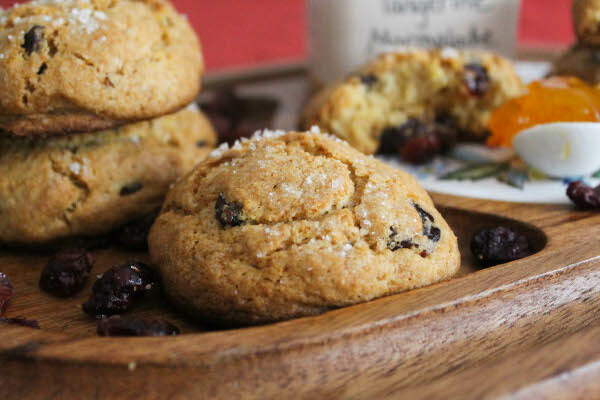 these Cranberry Orange Scones turned out to be just lovely. 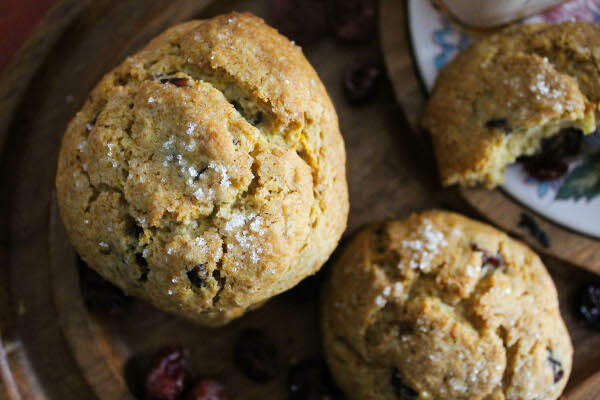 Buttery, crumbly, studded with sweet cranberries, and brightened with orange zest. Rustic looking, yes. Intimidating, no. In a big mixing bowl, whisk together flour, baking powder, baking soda, salt, and brown sugar. Add the cold butter and cut into mixture with two knives (or a pastry cutter) until the mixture resembles coarse crumbs. Stir in cream and orange zest and mix just until blended and moistened. Fold in cranberries. Form golf ball-sized scoops (I just eyeballed it) and place dough rounds on a parchment paper-lined baking sheet (I ended up with 9 scones). Sprinkle tops with sanding sugar. 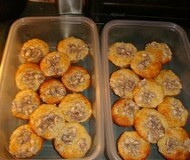 Bake for 12-15 minutes until the tops are golden brown. Cool for at least 10 minutes. 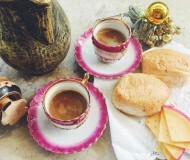 Serve plain or with orange marmalade and butter. Make these scones soon. No need to sweat it. On a more serious and somber note, a couple of days ago the Philippines was slammed by a super typhoon – one of the most devastating typhoons on record – with a death toll of over 1o,000. My family is safe and spared from harm, but many others are greatly suffering, and there is massive destruction. If anyone would like to help and donate to relief efforts, you can donate via Unicef, Red Cross Philippines, or Save the Children. And thank you to everyone who reached out to me asking about my family. I truly appreciate your concern. I think your scone attempt was successful! They look delicious. mmm these scones sound amazing! I love the combination of orange and cranberries. Perfecto. 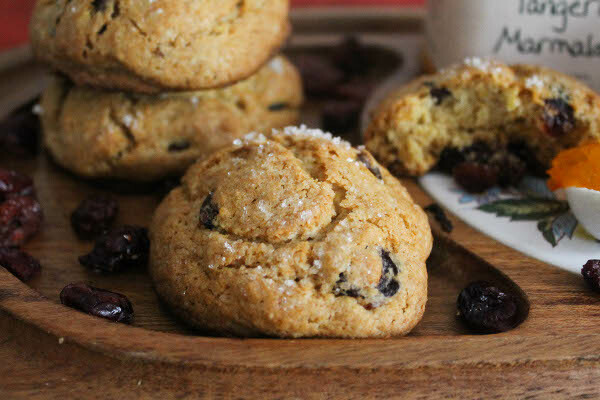 I love scones, and they are way easier to make than they seem! I find the key is to not overmix the batter so they stay flaky! Yours look delish! Scones are delicious and much easier to make than biscuits, I think. You did a great job and I love the combo! Looks like they turned out great in spite of your feeling intimidated. Delicious! I absolutely love scones, I will ask my sister to make them for me since baking intimidates me. I much rather be cooking! I’m so glad your family is doing OK. The scones look beautiful. Love the rustic look! I absolutely love making scones because they’re so easy and versatile. Yours are gorgeous!! Well I don’t think you need to be intimidated anymore because your scones look like they came out lovely and really delicious! Unrelated to scones but completely related to sweating: I sweat a lot too. I don’t understand how I’ll be in a yoga class dripping all over my mat, hands and feet slipping like I’m trying to do downdog on a slip-n-slide and the people next to me are completely dry. HOW?!? Yes I completely relate! My yogitoes towel has been really helpful, but I’m so dependent on it now! These look wonderful! Such a great fall combination. 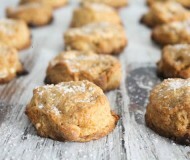 I have definitely been intimidated by scones, but I think this recipe will make me want to bake them again! So happy to hear your loved ones are OK! And I adore scones – I live dangerously close to Petsi Pies, and it’s torture not to go in there when they’re baking a new batch of scones! Thanks, Michelle. Ahh Petsi Pies is dangerous! I still think about the giant slice of Mississippi Mud Pie I ate there. So good! You totally dominated this! Great lookin’ scones, girl! Love your interesting flavor combo of chocolate, cranberrys and orange! Rustic looking scones are the best kind of scone! I love how easy these sound. What lovely scones! That flavor combination is heavenly. Ahhh scones are one of my favorite tea time snacks!! These look so delish!! I used to be intimidated by them as well and then followed a recipe and couldn’t believe how simple they were! This is such a great combo of flavors! 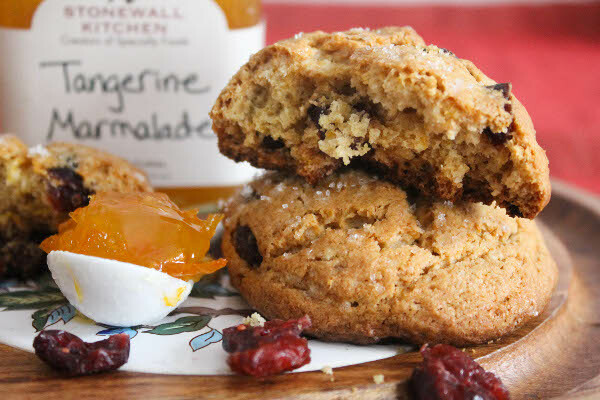 stonewall kitchen has tangerine jam now? ohhh I am very excited over this—the uses are endless. Mmmm butter and that tangerine jam on a warm scone?